The recent vow by Wisconsin Gov. Scott Walker (R) that he "can't compromise" with Democratic legislators on union rights runs sharply counter to preferences of Wisconsinites, according to a new survey of the state sponsored by a conservative think tank. The poll, conducted last week and sponsored by the Wisconsin Policy Research Institute (WPRI), finds nearly two-thirds of the state's adults (65 percent) prefer that Walker "negotiate with Democrats and public employee's unions in order to find a compromise solution" to the "current conflict over public employee benefits and collective bargaining rights." A third (33 percent) prefer the alternative, that Walker "stand strong for the plan he has proposed no matter how long the protests go on." WPRI bills itself as "Wisconsin's Free Market Think Tank" and their web site features articles critical of the union protests and supportive of Walker's agenda. But Kenneth Goldstein, the University of Wisconsin-Madison political science professor who directed the survey, tells The Huffington Post that he "had control over every aspect of the survey methodology" and applied the "best practices" of the field. The survey used live interviewers and reached respondents over both their landline and mobile telephones, and WPRI has released full results and cross-tabulations for every question asked (here and here). The results of the WPRI survey on common measures are also in line with other recent public polls of the state. Like other surveys, for example, WPRI found that Walker has a net negative job rating, with 43 percent expressing approval and 53 disapproval. That result falls within the margin of sampling error four other surveys conducted in recent weeks, including an automated survey by the Democratic-affiliated firm Public Policy Poling and two surveys sponsored by the AFL-CIO. Also, like the AFL-CIO surveys released a week ago, the WPRI study found more positive views of Walker's opponents in the ongoing controversy, the legislative Democrats (50 percent favorable, 42 percent unfavorable) and the public employee unions (59 percent favorable, 34 percent unfavorable). As you may know, Governor Scott Walker recently announced a plan that would require public employees to contribute to their own pensions and pay greater amounts for their health insurance, which would, in effect, be a pay reduction. The plan would permit most public employees to negotiate only their wages, and future wage increases above the rate of inflation would have to be approved by a voter referendum. Contracts would be limited to one year. In addition, Walker's plan also changes rules to require public employee unions to take annual votes to maintain certification as a union, stops state or local government from collecting union dues, and allows individual members to decide if they wish to pay union dues. Unions for law enforcement and firefighters would be exempt from the changes. 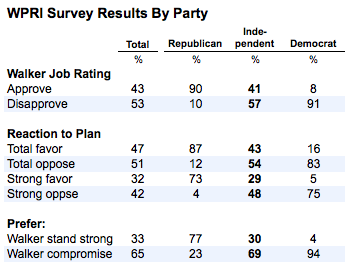 More Wisconsin adults disapprove (51 percent) than approve (46 percent) of the plan as described, and strong strong opposition (42 percent) is 10 points greater than strong support (32 percent). Tabulations of these results by party identification show strong polarization throughout the survey, but also show that political independents have largely broken against Walker. The give Walker net negative ratings, oppose his budget plan and, by a greater than two-to-one margin (69 percent to 30 percent), urge him to compromise rather than stand strong. However, these same results also demonstrate the challenges of achieving any such a compromise. Walker's base of Republicans overwhelmingly approves of both his performance as governor (90 percent) and his budget plan (87 percent, 73 percent strongly), and 77 percent want him to stand strong rather than compromise. Stripping most public employees of their right to collectively bargain over benefits and working conditions as part of a ploy to eliminate public employee unions altogether. Just 32 percent favor and 58 percent oppose this aspect of Walker's plan as described, and exactly half (50 percent) oppose it strongly. Limiting most public employees' ability to negotiate over non-wage issues in order to prevent local union affiliates from obstructing the budgeting process for local governments. The second version -- which changes a public employee's "right" to an "ability" and changes "stripping" to "limiting" -- still draws more opposition (50 percent) than support (47 percent). The survey does include cautionary results on the ongoing controversy for the Democrats. By a narrow margin (47 percent to 51 percent), Wisconsinites disapprove "of Senate Democrats' decision to leave the state in order to prevent the passage of the budget repair bill that would reduce public employee benefits and change collective bargaining rights."